Input to automatic controls. The drive is configured to operate within certain parameters. As data is collected it is automatically checked for compliance with the pre-set parameters. If anything is out of bounds, corrective action is automatic. Status information for pumpers. Data is immediately displayed on the local WiseGuy screen for pumper review. It is also available via Well Optix. With this information the pumper can quickly see how the pump is currently performing. Alerting. Data can trigger alerts when parameters are exceeded or other rules are broken. Alerts may appear on screens, be issued via text messaging or generate an automated call. Trending. Because drive data is stored it can be used to go beyond current condition monitoring. Production team members can access the rich history and look for trends whether simple or complex, for individual wells or whole fields. Pump off. Operators can monitor which wells pump off, how often and for how long. If the numbers are increasing over time, the operator may decide to refrack or take other action to stimulate the reservoir. Trends across the field may reveal a growing problem or one isolated to a subset of wells. Torque. For beam pumps, torque is an important parameter. It can indicate an impending pump off. High torque causes increased wear on pumping equipment. Trending analysis can help the production team estimate maintenance requirements, changes in the reservoir and potential parameter adjustments that may be required. Relative pump speed. Trending analysis can show if pumps are properly sized based on the percentage of full amperage or full rated speed they run. This can help in planning for future wells in the area. It could also be used as input to a decision to change out pumps in situations where a high horse-power pump is used in initial production then replaced with a lower cost, lower horse-power pump when less power is required to move the production. Heat. Excess heat in the pumping system leads to early equipment wear. Key parameters like torque, voltage, and pump speed can indicate conditions where excess heat is generated. Trending analysis of these parameters in combination can provide insight into conditions before a failure occurs. Remedial action can then be taken to prevent an unscheduled outage. Strokes/minute. For beam pumps, upstrokes/minute and downstrokes/minute are strong indicators of reservoir performance. In conjunction with pump off, these parameters can be analyzed for trends over time and across the field. Analysis can show the relative decline rate across wells. Voltage spikes. Voltage encountered by the drive can be monitored. That data can then be analyzed to determine if there are spikes, whether there is a pattern and which drives in the field are affected. Voltage spikes can damage pumping equipment and shorten its life. By identifying issues, operators can document problems to the utility or potentially address the spikes through additional front-end protection devices. A lot can be learned about wells and fields by looking at historical data. Relationships between different data sets may be discovered that can then be monitored and analyzed as early warning signs. 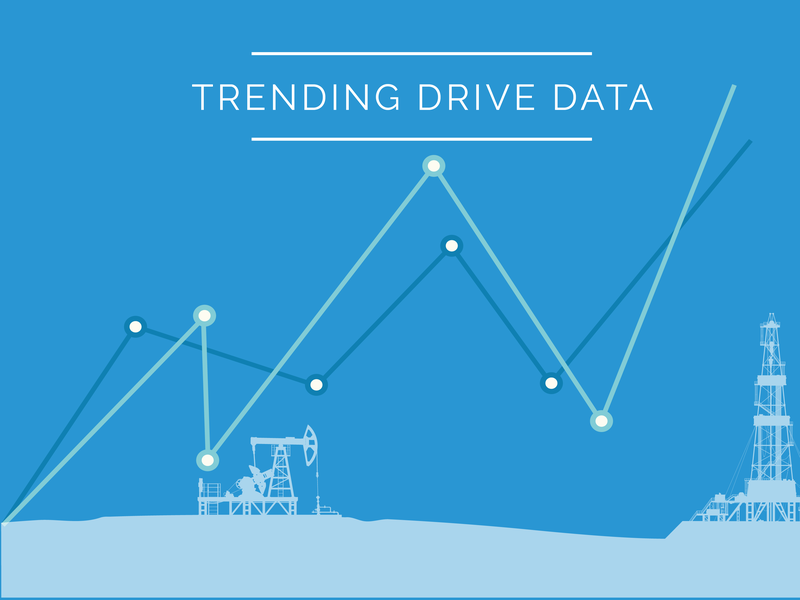 Trends that emerge from the data provide insight into ways to optimize production and minimize costs.